The Spring 2019 issue of the Labor Extension Bulletin is already available for download from this site. The lead article discusses the #MeToo movement and what it means for the labor movement. The issue also includes a special download on the new Massachusetts Equal Pay Law of 2018. See the "Publications" section. "A NEW GLOBAL LABOR MOVEMENT IS AWAKENING." So writes historian Dr. Annelise Orleck in her most recent book, in which she tells the stories of activists in low-wage fields. From Walmart workers to farmers, from the textile factories of Bangladesh to McDonalds' around the world, workers are coming together to challenge the iniquities of a globalized economy. Since the 1980s, state and local governments have been actively engaged in sending public services to the private sector. Proponents of this privatization process argue that the introduction of competitive market pressures to the public sphere will drive prices down, leading to the more efficient provision of public services. While at first glance there may be a certain logic to this theory, thirty years of privatization has proven the reality to be quite different. Note: This article is from the Spring, 2016 Labor Extension Bulletin. To download the whole Bulletin, click here. The Labor Education Center (LEC) has recently lead a powerful and creative training for the Amalgamated Transit Union (ATU) in New Jersey (March 26, 2016). The training was conducted by the new labor educator Camilo Viveiros and the LEC Director Kim Wilson. The LEC team was honored to lead this training along with the help and support of a proud group of ATU leaders. The ATU International and the NJ Locals are committed to providing training for ATU members. The goal is to build unity, knowledge and strength that will allow us to fight back against the organized efforts/campaigns that are looking to destroy us. You can see a short video with clips from this interactive workshop here. 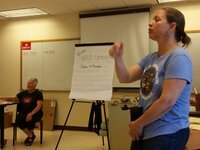 On Saturday, June 4, Anneta Argyres (UMass Boston) and Susan Winning (UMass Lowell) trained the women who are going to teach the advanced leadership class at the Wolmen's Institute for Leadership Development (WILD) this summer. WILD offers 2 levels of leadership training, A and B. Leadership B, the advanced level, changes every year to focus on different aspects of leadership. This way, women can return to WILD and learn new things every time. 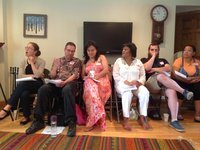 UMass LEP personnel have always played an important role in writing the curriculum for the workshops, and then training the teachers in the new curriculum. 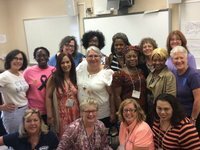 Labor Extension coordinators taught at the recent 39th annual Northeast Summer School for Union Women, which took place at Queens College in late July. The theme of this successful program -- attended by over 120 women -- was Our Movement – Our World. 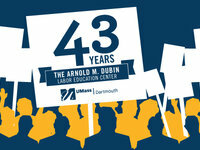 Coordinators taught Leadership Skills, Collective Bargaining, and Building an Economy That Works for Us! an adaptation of the AFL-CIO Common Sense Economics curriculum. See a few photos on our Photos page. Strategic Planning session for New Lynn Coalition. Susan Winning (UML) and Elvis Mendez from Immigrant Worker Center Collaborative facilitated a July session attended by representatives of all the member organization of the New Lynn Coalition.The New Lynn Coalition is a community/labor coalition on the North Shore that works for regional economic development that serves the residents of Lynn and revolves around social and ecological needs and concerns. Increased civic engagement, and good jobs, where workers’ rights to form unions is seen as central to economic health and democracy and becomes a core principle protected by the local regime. For more pictures, go to our Photos page.